Recording your heart rate while watching a movie will no longer affect your activity rings! Individual records will now no longer be sent to the Watch multiple times. Search with Open Movie Database (OMDb) requires this update. Feel free to suggest features or report malfunctions under Support. The improved and fine-tuned OMDb search will help finding the right movie – nevertheless it requires the knowledge of the year the movie went into cinema the first time! If in doubt I recommend checking the release year at IMDb. I also removed a bug which caused the reinstallation of the default movie while no internet connection is available. Please always save not stored records before updating to a new version! The Open Movie Database (OMDb) is currently under fire by some honks. 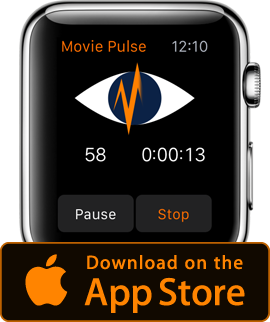 Therefore finding a movie with Movie Pulse after recording will fail at present. Please keep records at “Unsaved Records”, note the title & date and try again later. You can check the OMDb availability status here. No more unwanted pause/resume incidents. Improved usability for WatchOS, better save graph support and some bug fixes. and finally: stop/pause on Apple Watch has been transferred to a force touch menu. This will help to prevent accidental use of stop/pause/resume. We have to admit that iOS 10 has harmed the poster abilities of Movie Pulse. Please stay calm – the zigzag gray bar is not loved by us either. Be patient. We have it on our list.